Years ago, my college roommate, Liane took us to a Chinatown bakery, and bought a dozen shrimp dumplings for about $4. She doled them out when we emerged from the crowded closet sized storefront onto the bustling sidewalk. 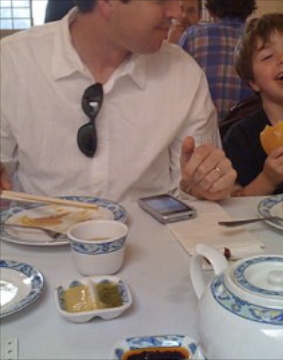 Much as one would divide their histories into “before and after kids,” or “before and after the career change,” or “before and after I got a smart phone,” I have pre and post dim sum, marked by that first taste of shrimp dumpling on a crowded San Francisco street. It squirted all over my awesome kid-sized Curious George T-shirt, ruining it forever – a small price to pay for dumpling shaped nirvana. Perhaps it was also a sign that even as a pseudo hipster 20-something, it was time to stop wearing the kid-sized Curious George tee in public. Before we knew it, our favorite San Francisco Saturdays as newlyweds were spent convincing the bakery lady that, yes we did want 42 shrimp dumplings and 2 Cokes so we could have lunch at the cold beach. 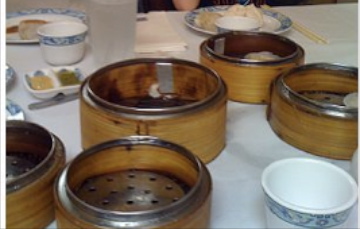 Or when we were feeling fancy, we’d wait for the good stuff to be pushed by on a cart in a dim sum restaurant. There’s a tripe incident I don’t like to talk about, but if you have the opportunity to select your items from the cart, don’t put your face directly over the bamboo steamer basket when they open it. A tripe facial is not something one soon forgets. Our Richmond District neighborhood that bordered what is considered by many to be San Francisco’s “New Chinatown,” still boasts Ton Kiang which is delicious and perfect if you can take off at 11:00 on a weekday and head that far down Geary Blvd., because then you can totally…probably… ma ybe get a table. 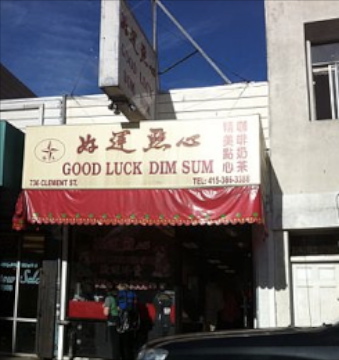 For the bakery experience, we head to Good Luck Dim Sum. I don’t know how God feels when I do this, but when we venture here, I start praying for a parking space when we’re within a mile radius of the place. But, alas, we usually end up at Hong Kong Lounge. It has pink awnings, and at some point within the last decade changed their name from the far classier Hong Kong Flower Lounge. Now that the beautiful old theater where we saw “She’s All That,” is shuttered and forlorn, Hong Kong Lounge is that block’s reigning crown jewel. It sits between the old biker bar John ended up at when he locked himself out of the apartment, and the Ross Dress for Less where I went when it was my turn to lock myself out. We moved away from the city years ago, but manage to find our way back on chilly days when we are feeling a little nostalgic, and a lot hungry. We’ve dragged along dear friends like our seminary compadres, Megan & Harold and their kiddos. As we’d wait outside for our name to be called, our little children would press their faces against the glass to stare at the diners inside, or they would tuck their arms in their shirts and huddle together for warmth on the cold sidewalk. John taps the tiny little pencil against the paper, and I can see his eyelid twitch with all that thinking. I try to keep the boys from using their chopsticks to stab each other, poke themselves in the eye, or dig at that hole in the padding of their chair. The waiter whisks the sheet off our table and John informs us our adventure plate will be the doughnut noodle roll, which arrives first. “Yes, dear?” I look back at the boys who are blissfully staring out the window, their faces shiny from our feast. If I had to be pick him being super pumped to see my old bank branch or excited to share a dim sum meal with us – I’ll take the doughnut noodle roll, thankyouverymuch. *The restaurant above is actually yummy Ton Kiang, and I snapped that pic of Good Luck one day as we were probably looking for parking. 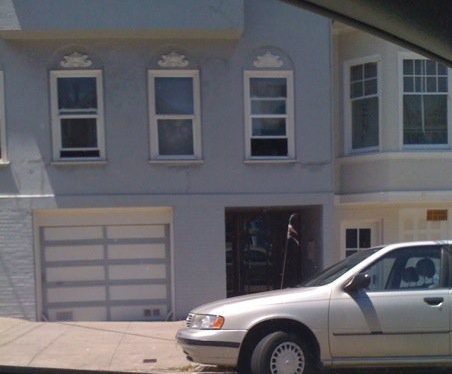 That building there to the right is our old San Francisco apartment. That might be our former neighbor’s car. Wow, Gary & Linda – I’ll save them for another blog. Does MSG still make John’s arms numb? hahaha! You have an AMAZING memory my dear. We don’t think so, or he’s very good at hiding it! THANK you for reading! !